It is interesting to watch our surroundings change. As time passes, places come and go. Looking back at my town, I can think of places that used to be. There were stores, restaurants and other popular places. They were locations where you could find people who you knew. They were places that helped define the community. It is sad to think that younger folks and newcomers do not know where and what those places were. For me, the places from my childhood pop into my mind on occasion. I might be riding by where they used to be and remember being there. I could be listening to a song and have the memory of a place come to my mind. In fact, there is one song that always brings a certain place into focus. When I was a kid, one of my favorite songs was “Take Me Home, Country Roads” by John Denver. I have no idea why I liked it, but it still brings a smile to my face when I hear it. The tune is great. The words are great. When I was a kid, I could sing the entire thing. As an adult, I realize that the song is all mixed up. It is about West Virginia, but the words describe Virginia. It does not matter because I can look past all of that. Instead, this song makes me look back at a restaurant that is long gone. El Rancho sat on the outskirts of town and specialized in barbecue. For me, it was always an adventure to eat at El Rancho. through the eyes of a child, it was like going on a long journey to a far away place. In fact, it was only a few miles away. I think that it being on the other side of town made it seem further. There was also the food. I cannot tell you if the barbecue was good, but they always made the best french fries. What kid does not like french fries? On top of that, these were the best french fries ever cooked. I can still see them, smell them and taste them. They were awesome. You are probably asking yourself a question. What does a song about one of the Virginia’s have to do with a barbecue restaurant in Tennessee? the answer brings me to the other adventurous part of the restaurant. The booths had tabletop jukeboxes, and they were the coolest things I had ever seen. I could pick the music in the restaurant by dropping a nickel in the slot and flipping through the pages. 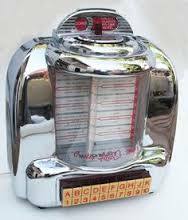 Just push a letter and a number and the song would play. I always picked “Take Me Home, Country Roads.” I would have played it over and over if my parents had let me. After all, who does not want to hear the same song multiple times? I do not remember when El Rancho closed, and I do not remember the last time we ate there. However, I still remember the french fries, and I still remember playing that song on the jukebox. I have always wondered why Virginia is not called East Virginia. Your post has just made me look up the answer to that question. It’s all about a split during the Civil War. Take Me Home Country Roads is one of those songs over here in England that people like to sing when drunk! It’s fun to play on the guitar too. I didn’t realize that it was international.